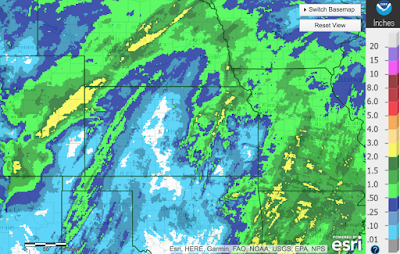 MSE Creative Consulting Blog: How Much Rain Has Fallen So Far? Here we are, into the third day of the extended period of rain for the Great Plains. The rainfall amounts, so far, are below. The yellow areas have had more than two inches. There is a tiny spot in eastern Colorado with three inches. Of course, my house had 0.08 inches.